The Sir Matt Busby Player of the Year, previously known as the MUFC Members Player of the Year (1988–95), is an award presented to the Manchester United fans' player of the season. It is named after former Manchester United manager Sir Matt Busby, who managed the club in two spells, from 1945 to 1969 and from 1970 to 1971. 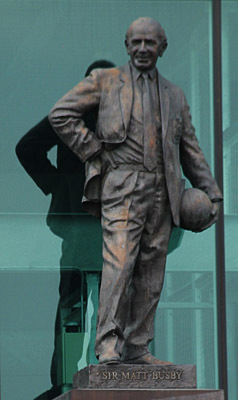 The award was renamed in his honour in 1996, following his death in 1994, and a new trophy was commissioned – a scaled-down replica of the statue of Busby at the east end of Old Trafford. The first winner of the award was Brian McClair in 1988, who became the first player to win it twice in 1992. Since then, six other players have won the award more than once, of which four have won it in consecutive seasons: Roy Keane (1999, 2000), Ruud van Nistelrooy (2002, 2003), Cristiano Ronaldo (2007, 2008), and David de Gea (2014, 2015, 2016). Ronaldo's 2008 win made him the first player to receive the award thrice, having also won in 2004. 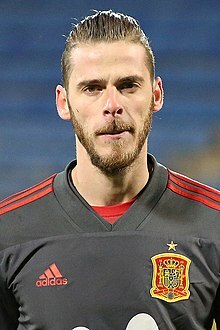 De Gea won the award in 2016 for the third consecutive year, becoming the second player after Ronaldo to do so, and the first in three consecutive seasons. After Ander Herrera won the award in 2017, David de Gea became the first player to win it four times, in 2018. Voting takes place towards the end of each season, usually in April, and is open to anyone who has an account on the club's official website. Voting was originally done by post until the 1994–95 season, when a phone voting system was introduced. Postal voting forms were included in the club magazine, Inside United, and before that, voting was open only to members of the official supporters' club, who would receive a voting form in the post at the end of the season. Until the establishment of the official supporters' club, a separate award had been given by the members of its predecessor, the independent Manchester United Supporters Club. Other end-of-season awards given by Manchester United include the Denzil Haroun Reserve Player of the Year Award, the Jimmy Murphy Young Player of the Year Award, the Players' Player of the Year Award, and the Goal of the Season Award. Of these, the Jimmy Murphy Young Player of the Year Award and the Players' Player of the Year Award are voted for by the players. The prizes for all five awards are given at an annual awards night, which is held near the end of the league season and broadcast live on the club's television channel, MUTV. A list of winners of the youth awards can be seen here. Brian McClair won the inaugural award in 1988. ^ Butler, Cliff, ed. (2004). Manchester United Official Yearbook 1994. Manchester: Manchester United Football Club. p. 161. ^ a b c d e f Tuck, James (18 May 2011). "Fans honour Hernandez". ManUtd.com. Manchester United. Archived from the original on 24 August 2017. Retrieved 19 May 2011. ^ "Legends: Mark Hughes". ManUtd.com. Manchester United. Archived from the original on 27 May 2016. Retrieved 31 July 2011. ^ "First team: Ryan Giggs". ManUtd.com. Manchester United. Retrieved 9 October 2011. ^ a b c d Bostock, Adam (4 May 2010). "Rooney wins club award treble". ManUtd.com. Manchester United. Retrieved 11 July 2011. ^ Bostock, Adam (15 May 2007). "MUTV Online: United awards". ManUtd.com. Manchester United. Retrieved 11 July 2011. ^ Bartram, Steve (11 May 2008). "Player of the Year awards". ManUtd.com. Manchester United. Retrieved 11 July 2011. ^ Hibbs, Ben (17 May 2009). "Vidic does the double". ManUtd.com. Manchester United. Archived from the original on 4 March 2016. Retrieved 11 July 2011. ^ "Fans honour Valencia". ManUtd.com. Manchester United. 14 May 2012. Retrieved 15 May 2012. ^ Tuck, James; Marshall, Adam (15 May 2013). "Van Persie wins fans' award". ManUtd.com. Manchester United. Retrieved 16 May 2013. ^ Froggatt, Mark (8 May 2014). "De Gea wins fans' award". ManUtd.com. Manchester United. Retrieved 8 May 2014. ^ Froggatt, Mark (19 May 2015). "De Gea is Sir Matt Busby Player of the Year". ManUtd.com. Manchester United. Archived from the original on 1 December 2017. Retrieved 19 May 2015. ^ Higgins, Adam (1 May 2018). "De Gea wins Player of the Year award". Manchester United F.C. Retrieved 1 May 2018. This page was last edited on 7 January 2019, at 12:27 (UTC).